The Arabic word intifada literally means throwing or shaking off . It also means abrupt and sudden waking up from sleep or unconcerned status. The English translation for Intifada is rebellion . The Palestinians were under the rulership of the Israelis and they wanted to be self-governed. Ironically, Arafat, the leader of the PLO, consistently made choices to fuel the conflict and prevent this self-governing to happen. But that is another story. The tension between the Palestinians and the Israelis was increasing. On October 1, 1987 the Israeli military ambushed and killed seven men from Gaza believed to be members of the Palestinian Islamic Jihad terrorist group. On December 4, 1987 a Palestinian stabbed to death Shlomo Sakal, an Israeli, who was shopping in Gaza. On December 8, 1987 there was a traffic accident involving an Israeli military semi-truck that lost control and crashed into two vans killing four Palestinians from the Jabalya refugee camp in Gaza. The next day there were violent protests and mass rioting in Jabalya. At the Erez checkpoint, a 17 year old Palestinian youth who was throwing rocks and Molotov cocktails at the Israeli Army patrol was killed by an Israeli soldier. By December 9, 1987, the date considered to be the beginning of the Intifada, there was a spontaneous wave of unrest, general strikes, protests, demonstrations, and civil rioting that spread from Jabalya to the Tulkarim, Kalkilya, and Jenin refugee camps and to places throughout the territories. Existing Palestinian organizations, union groups and newly created institutions urged the ordinary population to come out in large numbers to protest and riot in the streets. There was rock-throwing, blocked roads, and tire burnings. By December 12, 1987 6 Palestinians had died and 30 had been injured. The rock throwing was done by Palestinian youth. They taunted the Israeli soldiers. Kill us all! Come and kill us all or get out! An amplified voice at mosque's minarets blared encouragement to the young Palestinians. O, you young people, go at them, don't back off! The rock throwing resulted in images of Palestinian youth confronting the Israeli tanks with rocks. The media images scored points for the Palestinians. Palestinian youths throwing rocks during the Intifada. Although what became the Intifada was initially unplanned, the PLO leadership, who in 1987 was in Tunis, began to coordinate the uprising principally by newspaper, radio and television media and writing leaflets that were secretly distributed to the Palestinian population on the average of every two weeks. The leaflets provided detailed guidlines for the uprising: what to do and when to do it and what not to do. It included various forms of civil disobedience and making disturbances by stone throwing, firebombing, building barriers, graffiti, and clashing with Israeli troops. At the appointed times and places, the PLO leadership sent shock squads to encourage and lead these activities. All this enabled the PLO leadership to alert the media ahead of time to have journalists and photographers prepositioned to see and write about not only the reality of the civil disobediences and rioting, but also the various PLO staged fake scenes of Palestinians being wounded. The coordinated actions with the media and the directions to the Palestinians of what to do amounted to a combined uprising and psychological warfare against Israel. This combination confounded the Israeli military and government who had the superior power but whose inability to use images and media to create sympathetic emotion in the reader clearly put them at a disadvantage in the media game of world opinion. 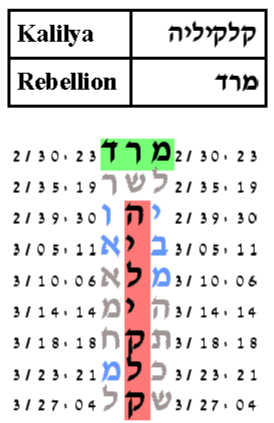 Our exploration of Torah codes will use as key words either intifada, אינתפדה, or its Hebrew translation rebellion,מרד. 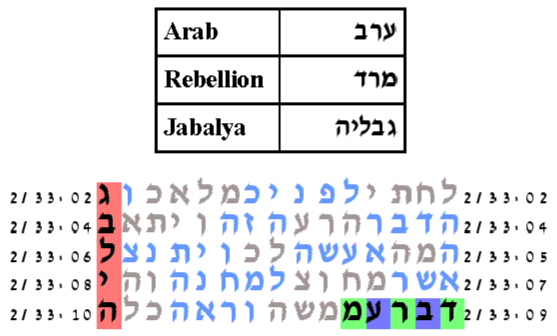 We will begin with rebellion paired as Arab rebellion, מרד ערב. The rebellion began in Jabalya and continued to the other refugee camps, the main ones being Tulkarim, Jenin, and Kalkilya. We will take each of these as key words in turn as an addition to Arab rebellion. Jabalya has two possible spellings as can be seen by examining the media or internet. It can have one Yod or two. We will try both. In total we have 5 key word sets, each key word set having three key words. We set the expected number of ELSs to 30. The following five tables are the resulting smallest area tables. We use our standard methodology to combine the results trial by trial. In a 10,000 trial experiment, the probability that a text from the ELS random placement text population would have as a combined compact result as the Torah text is 3.5/10,000. The expected number of ELSs is set to 30. The cylinder size is 15 columns. The probability that a text from the ELS random placement text population would produce as small a table as this is 336.5/10,000. The expected number of ELSs is set to 30. The cylinder size is 1821 columns. The probability that a text from the ELS random placement text population would produce as small a table as this is 5,644/10,000. The expected number of ELSs is set to 30. The cylinder size is 5715 columns. The probability that a text from the ELS random placement text population would produce as small a table as this is 6,680/10,000. The expected number of ELSs is set to 30. The cylinder size is 115 columns. The probability that a text from the ELS random placement text population would produce as small a table as this is 81.5/10,000. The expected number of ELSs is set to 30. The cylinder size is 1578 columns. The probability that a text from the ELS random placement text population would produce as small a table as this is 16/10,000. In a 10,000 trial experiment, the probability that a text from the ELS random placement text population would have as a combined compact result as the Torah text is 3.5/10,000. Our methodology combines the results trial by trial and gives a result statistically guaranteed to be smaller than the upper bound produced by the Bonferroni inequality, which in this case is 5 times the smallest p-value or 80/10,000. There are a few other tables that are statistically interesting. 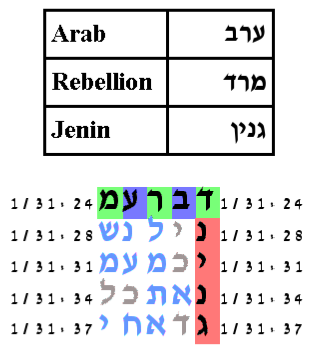 One involves the key word Jenin with the key words Arab and Rebellion. Here the expected number of ELSs is set to 200. This produces a compact table. The probability that a text from the ELS random placement text population would produce as compact a table as the one produced by the Torah text is 25.5/1,000. The expected number of ELSs is set to 10. The cylinder size is 180 columns. The probability that a text from the ELS random placement text population would produce as small a table as this is 25.5/10,000. Another statistically interesting table involves the key word Kalkilya paired with the key word Rebellion. The expected number of ELSs is set to 10. 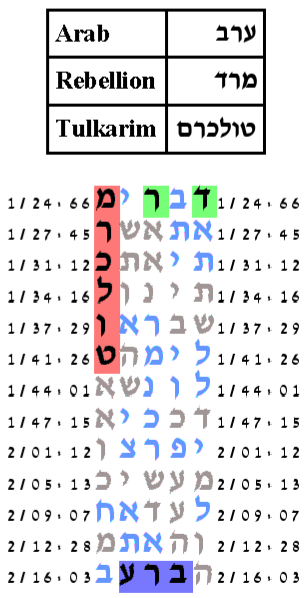 The probability that a text from the ELS random placement text population would produce as compact a table as the one produced by the Torah text is 16.5/1,000. The expected number of ELSs is set to 10. The cylinder size is columns. The probability that a text from the ELS random placement text population would produce as small a table as this is 16.5/10,000. 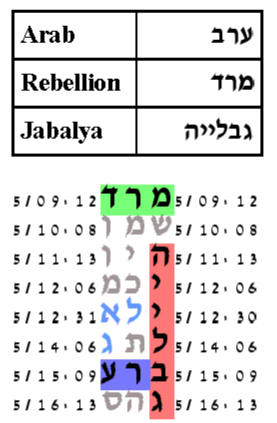 There is another table involving the key word Kalkilya with the key words Rebellion, Philistines, PLO, Fatah, and the zociac sign Capricorn which is the zodiac sign of the Philistines. The compact table is shown below.